The site is elegant; he must have put a lot of work into it. Through his site, you can donate to this guy’s non-profit* or you can buy a Master Edition two-foot by three-foot copy of his work, on canvas, for a mere $6,850.00 or a signed and numbered paper print for $101.00 (but be fast because the artist will increase the price by one dollar for each one he sell or something like that) . You can also have a postcard sized print for $19.00. But now, with the tools of modern computer technology, space-age photography and the hands of a truly inspired artist, E. Laurence Bake, a stunning new reality has been REVEALED – a mathematically precise, magnificently rendered, life-like "Portrait of the Man In The Cloth." And who could have imagined such precise facial features, or the stunning masculinity and profound gaze of love, understanding and spirituality that has awaited Man’s discovery for centuries. In this OFFICIAL online exhibition The Man In The Cloth is now fully revealed, visible for all of us to marvel at and wonder: What kind of glorious creator (God or artist) could have possibly made and preserved such powerful masculinity, such beauty in a simple piece of cloth? As International businessman, Vijay Kumar put it, "It’s as if he is emerging out of the darkness of Man’s violent past, into the light of the new modern age. 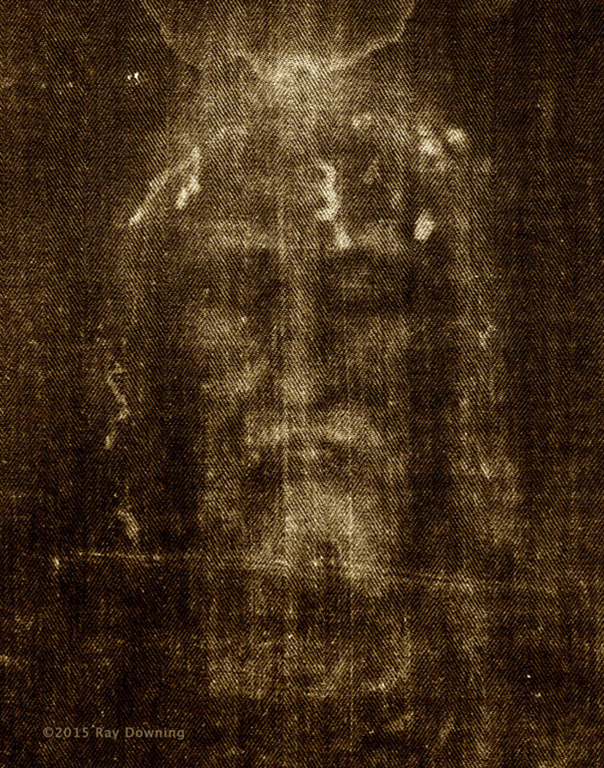 The Shroud is the image of a crucified man, yet when I look into those eyes all I see is pure love and compassion." Retired ship Captain, Val LaFrance commented, "How could anything so magnificent be hidden in the threads of a linen cloth, waiting until Man could fly ships to the stars and the tools of the modern age were capable of revealing His existence? It’s a masterpiece." Yet another viewer concluded, "It is an invitation to humanity to look beyond the limits of the material world and ask: what treasures might the human spirit hold? What kind of world could we create if love and compassion replaced hatred and violence on Earth?" This OFFICIAL, non-profit website is dedicated to sharing The Man In The Cloth Portrait with all, regardless of race, color or Creed. We are also dedicated to providing you with only the finest, highest quality reproductions of The Portrait possible with todays technology. Every Limited Edition released is designed to hold its value, color and beauty for the next 100 years. * I just wonder if this Florida-based non-profit fellow has filed a 501(c)3 with the IRS. And what does OFFICIAL mean? 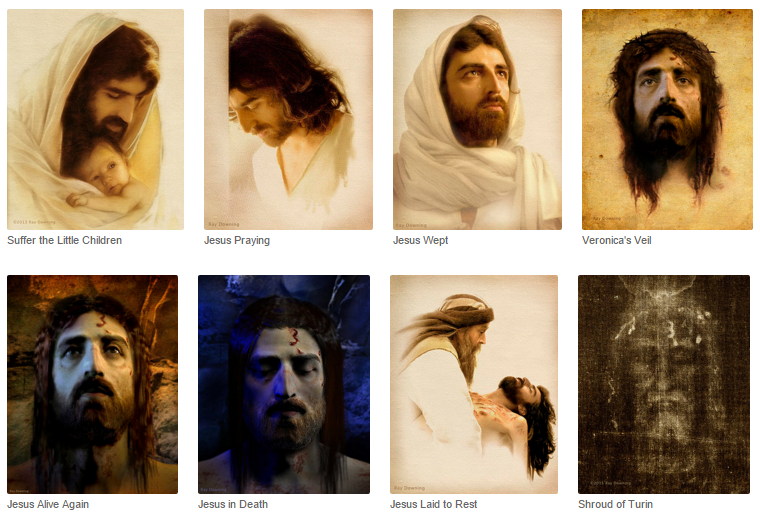 Works of art by Ray Downing (The Real Face of Jesus) is for sale at Fine Art America. Various display quality formats* are available including folded greeting cards. A 24 x 30 canvas print with metal frame will set you back $351.10. Smaller sizes are available. Ray Downing is an Emmy winning 3D digital artist. In 2010 he created the Virtual Abraham Lincoln, which was featured in the History Channel special ‘Stealing Lincoln’s Body’. The following year he created a Virtual Jesus using the 3D information found in the Shroud of Turin. 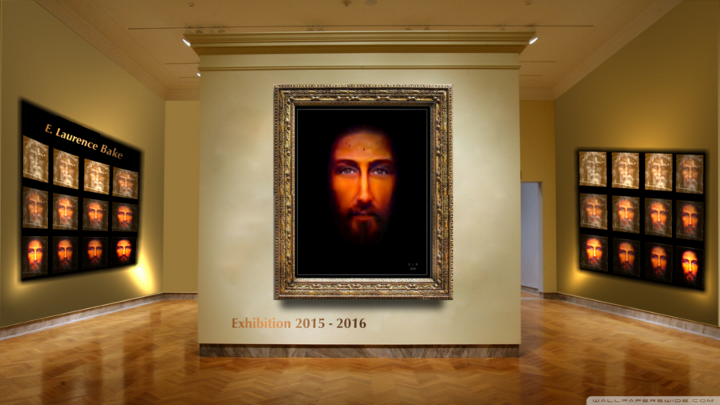 The Virtual Jesus appeared in another History Channel special entitled ‘The Real Face of Jesus?’ which was nominated for several international non-fiction awards and has been aired around the world. In case you missed it, our Backlit Shroud Face transparency in 11" x 14" PhotoGlow Frame is ON SALE until December 31, 2015. Each transparency is mounted in a custom frame only 13/16" thick and is ready to hang. The built-in LED backlighting system is equipped with an inline dimmer that allows you to adjust and control the brightness of the backlight display. Read more [here] … or click on the photo below for details. 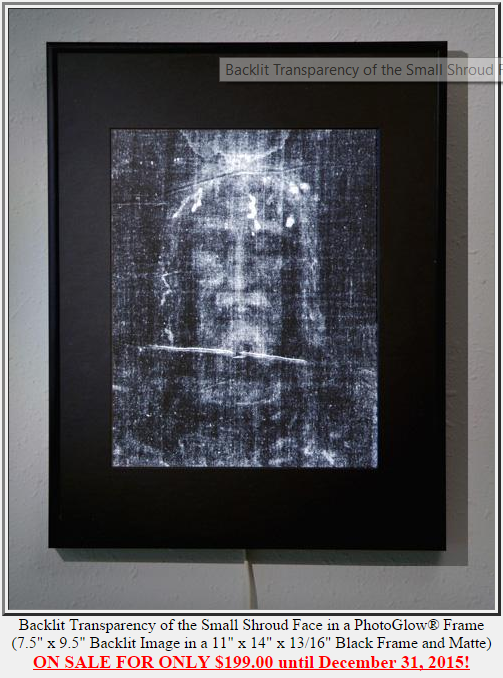 This is a great gift for those who want to display a truly striking image of the Shroud in their homes or offices. Jesus Christ, what did he really look like? 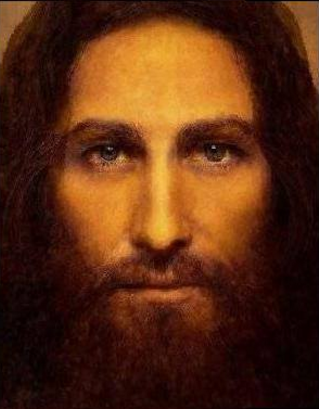 I made this picture by combining several Jesus images made by artists throughout centuries. Here is one view on this matter. 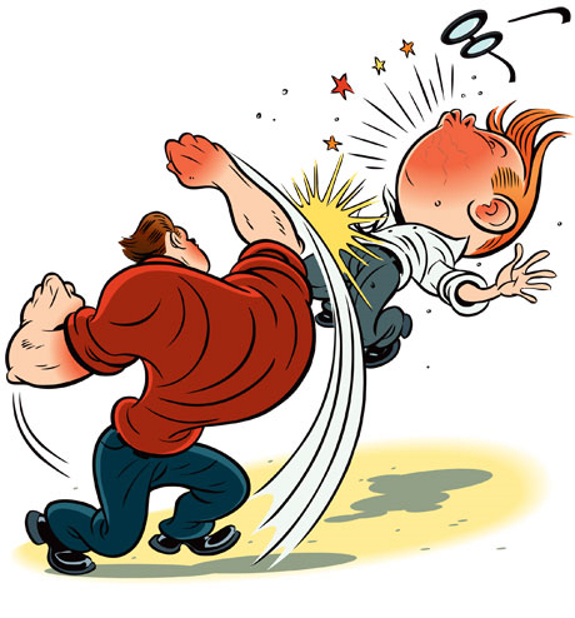 He also made an interesting video using this image. This video tells about God who is present and can be found anywhere through faith in Jesus Christ. Just let him into your Heart to be your friend that never lets you down. I made the picture of the man in video through combining several Jesus pictures into one with Imagemorph. What he really looks like? I think that is not important. But for me it is great to know (and believe) that one day we will see Him face to Face. Here is the second part of an interview I did with Isabel about 7 years ago and in this segment, Isabel addresses whether the Shroud could have been the work of Leonardo da Vinci. some of us have spent the best part of 3-4 years, attempting to fit together the pieces of the ‘Shroud’ jigsaw puzzle – scientific, historical and biblical, to form a coherent and credible whole. Charles Freeman appears not to understand that there is a jigsaw puzzle, or if he does, has contemptuously kicked it aside in his oh-so-condescending magazine piece that tells the world it was ‘just another painting’ , which conveniently for him has somehow managed to lose ALL chemical traces of its pigment leaving us scientists dottily obsessed and spellbound by a mere ‘shadow image’ (undefined except, that is, for its curious and unique set of properties – negative but non-photographic image, 3D properties, ultra-superficial, easily detachable, half-tone character, diimide-bleachable, etc etc). Taking a celebrated line from "1066 And All That" I personally would rather be seen as "Right but Repulsive" than "Wrong but Romantic". From Colin Berry’s posting entitled, The Turin so-called Shroud: stunningly successful realization of a 14th century thought experiment? 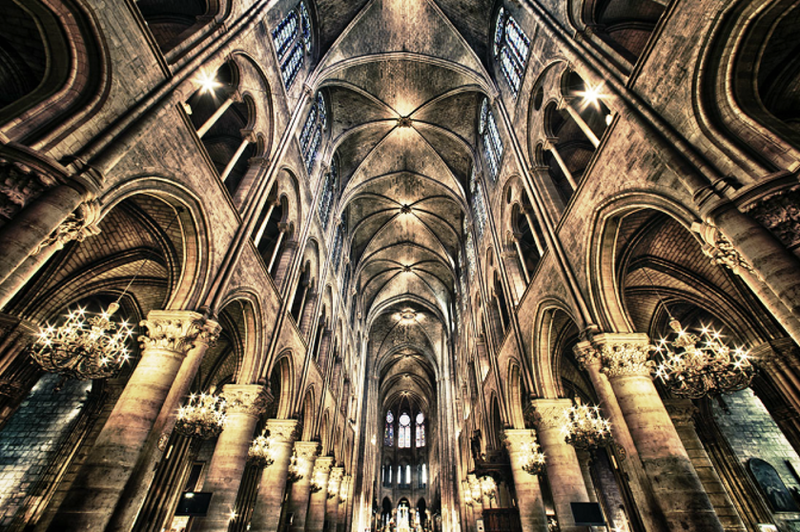 Notre Dame Cathedral Paris, built 1163-1345. That’s just the inside. 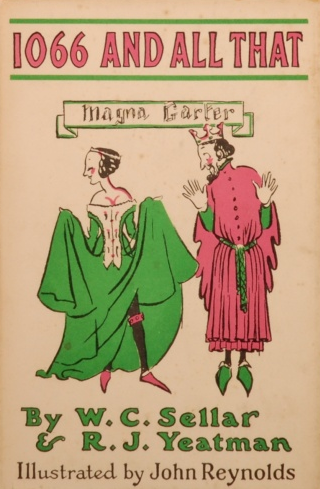 One wonders how the unsophisticated medieval mind as portrayed by Charles Freeman, so easily confused we’re told between one image and another, pre- verus post-mortem, could have been capable of producing this. It’s easy. Some people, even today, are confused between negatives and positives, etc. Nonetheless, point taken.